Terex Skid Steer line has a wide range of power from the small 50 Horsepower Skid Steers to the much larger more powerful 86 Horsepower Skid Steers. Even with all that power without good tires to get you good traction your machine will not be as efficient as it could be. Monster Tires is here to provide you with quality Terex Skid Steer Tires at unbeatable prices and the best customer service in the industry. When you call Monster Tires with any questions about Terex Skid Steer Tires our knowledgeable staff is here to give you as much help as possible and offer you the best prices. If you are looking for top quality tires and great customer service for your Terex Skid Steer, you have come to the right place at Monster Tires! 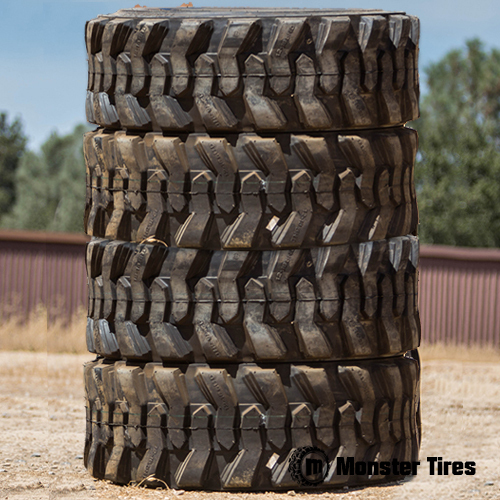 Whether you need a Front Tire Set for Terex Skid Steer, a Rear Tire Set for Terex Skid Steer, or a Set of 4 Tires for Terex Skid Steer, we have what you are looking for here at Monster Tires. Fully Staffed 9-5 Office of Construction Equipment Tire Experts! A great buying experience isn’t just about the object you buy, it’s also about the help you receive while you are trying to figure out what you need to buy and how well your questions are answered. Here at Monster Tires, we provide full customer support and advice from experts on your Construction Tread Tires for Terex Skid Steer and your Off the Road Tires for Terex Skid Steer. Trust in Monster Tires for your next set of Terex Skid Steer tires!